It is a project for the creation of a video game platform online (free), Android (free demo) and facebook (free), to be published in the final version for a fee GooglePlay (and others Appstore) 0.49 €. Giocate gratis alla versione demo online :) !! To have followed a game at any level needs a story. 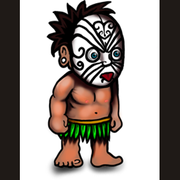 MaoriTheSpirit's is the story of Tame (which in Maori means boy), son of the head of a Maori tribes of ancient times, which must pass tests to become man and sit with his father as a prince of the tribe. The mission of Tame is to go into the forest before, and finally into the sea after the volcano to meet the spirits of nature that will test and will also give life and energy to face the dangers of life. The spirits of nature will use representations (Maori tattoos) to create an adventure for Tame that I will become a man and to use the weapons that will be in the cabin of his father, King Maori. It seemed interesting to use this story in the fantastic images of tattoos of Maori culture, rich in suggestion and certainly unusual in the context of video games. A spiritual world and fascinating that has many fans. 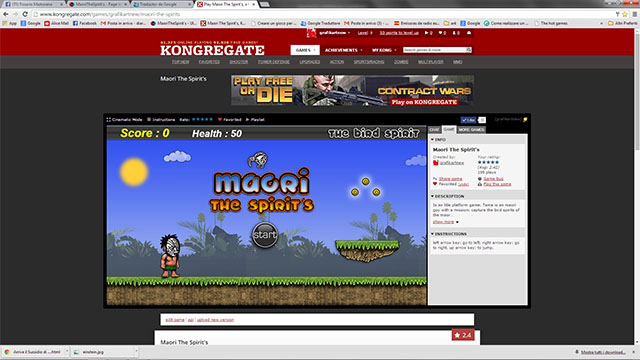 Maori and the spirit's 'a pretty classic platforming and that' a typology much back in fashion. Simple and fluid suitable for spending time with little effort. 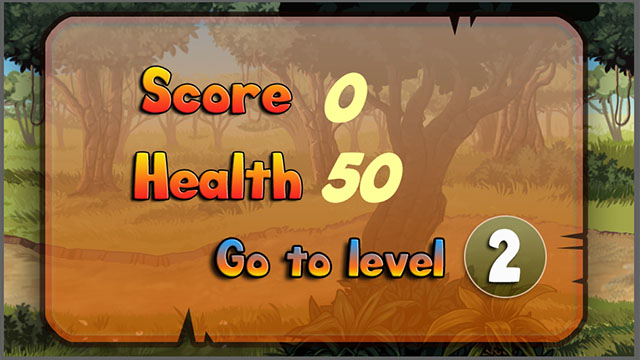 But requires a minimum of attention if you want to pass all the levels and see the story progresses. The growing supply of 'social and casual' games on the network in recent years has led to a strong increase of public and market participants around the world of multiple platforms games. Games that are consumed directly online and which can be accessed simply by your PCs, smartphones, tablets, and video game consoles from home. engaging and clear graphical and light, in any way that requires low hardware requirements compared to current standards. a community or social network, such as the many games offered on Facebook. Other segments of the online gaming market are mobile games and network games with the use of video game consoles. An expanding market, then, full of opportunities for marketers applied to online gaming. - www.games.com - www.friv.com/ - www.giochigratisonline.it - www.giochi.it/ - www.kongregate.com/ - www.scirra.com/arcade . - And many more! The portals of online games are an excellent development platform to create fan and then the public. They offer tools to promote the game giving it the widest possible spread and allow you to enter any sponsors. 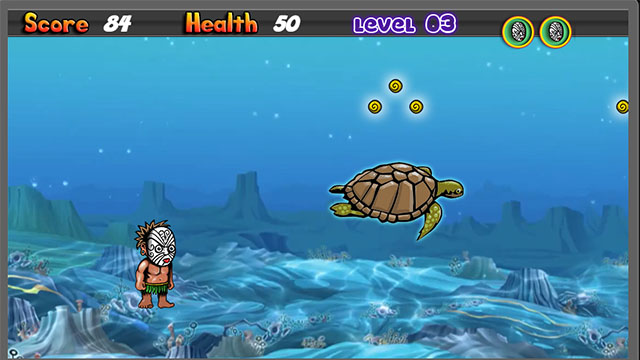 The funds raised through this campaign servirano to bear the costs of programming and graphics to make the mobile version (Android and IOS) and increase the levels of the game up to thirty. The promotion on social networks. The realization of a nonviolent game (against) suitable for children without zombies, deaths and disasters, which then also has an educational dimension, to apply for basic gratifications. NOTE: I beg to publish the project even though it is a work in progress because I also need to co-workers because we are building a group of game developers working together through the network, who from canary like me, who from Barcelona and from Pisa and catanzaro. Ours is a project that serves to compensate for the lack of work and helps those wishing to participate in projects related to online and mobile gaming, the concept and more that no matter where we are, there is more work fixed under the house, we have to sfuttare the opportunities offered by the network and collaborate together around good and healthy projects and divide the profits. This is the real long project: create a game house with talented people, free and willing to "create". House Games a truly free, independent with collaborators around the world!